My gorgeous cousin, @BridestockBride is getting married in less than a week. Not one known for convention, she and her hubby-to-be are having a wedding festival. In amongst all the excitement, she's planning on having a tea tent with a cake stall and has been buying vintage china like a demon for the last year. Any of the guests who are vaguely capable of baking have been asked to bring some cake with them. 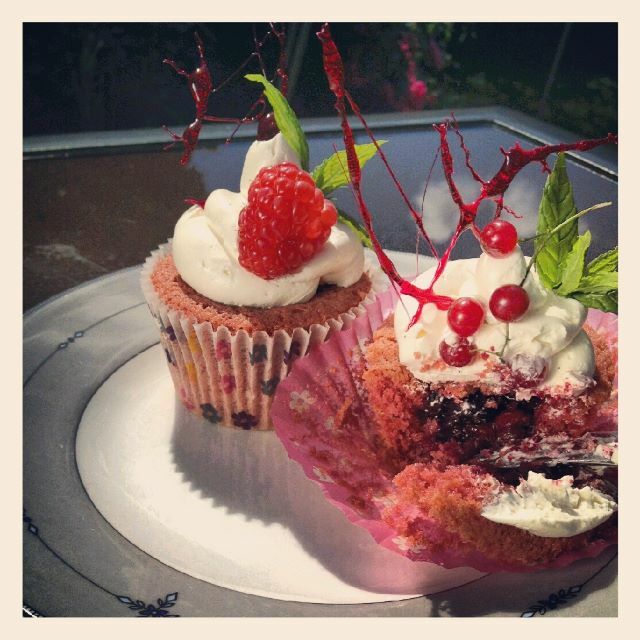 I still haven't quite decided what I'm making, but I came up with these cupcakes as a potential option. Summer pudding is something that we never had when I was growing up because my mum doesn't like the 'soggy bread' outside. For the same reason, we rarely had trifle as she doesn't like soggy sponge. 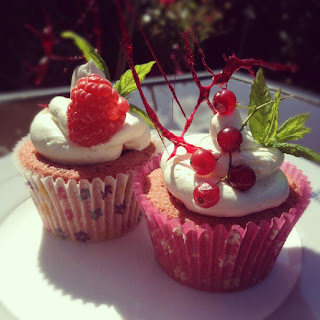 But I love summer fruits and figured that you could do a pink-tinged hidden middle cupcake with a dollop of 'cream' on the top. I Googled about for recipes but couldn't find one so came up with my own. Yesterday I made a half batch of cakes for a trial run and decided to add it to the blog today - even though it means a double-blog-day with my Olympic Food Challenge meal coming later tonight. Because I'm not sure what the weather is going to be like come Saturday, I went for a topping of Italian Meringue Buttercream (IMB) because it's firmer than standard English Buttercream and will hopefully stand up to a warm day better. Having mastered Swiss Meringue Buttercream (SMB) a few months back for my epic raspberry cake, I decided it was only fair to try IMB as well. The end product for both SMB and IMB appears to be the same. I don't have any SMB to hand to do a true comparison. But the cooking method is slightly different. With SMB, you heat the egg whites over a bain marie with the sugar and then whip them. IMB requires you to add hot sugar syrup to partially whipped egg whites. In both cases, you then whip the meringue to within an inch of its life, throw in a huge pile of butter et voila, buttercream. The recipe I picked for the IMB instructed me to boil my sugar for seven minutes and gave no temperature. After four, it started to turn caramel in colour so I popped in my Heston thermometer and it told me it was 168c already. Disaster. A quick Google revealed that the syrup should be no more than 110c. The second batch took just over two minutes from initial boil to being ready. Rather than waste the first batch, I threw in some pink food colouring and made some sugar graffiti just for the fun of it. I remember seeing Lorraine Pascale do this and I was just interested in how to work with it and how long you have between pouring it and being able to flex it onto things and the moment when it sets hard and will just fragment. Whilst making up the cakes, I then thought the fragments of sugar would add an extra dimension to the finished cake. I asked the husband for his opinion. It wasn't polite (I must confess I was so deflated, I tweeted exactly what he said). But I'm pleased with them. Mix the eggs, milk and rosewater in a jug. Pour half of the milk mixture into the flour mixture and beat slowly until combined. Scrape down the sides, add the rest of the milk mixture and then beat until you have a smooth batter. Add a little red and purple food colouring to the batter and beat well until you have a dark pinky-purple colour that you're happy with. It's important to use gel colours as you don't need too much of them to get a good colour and they won't make the cake batter to liquidy. Meanwhile, make the filling by putting the frozen berries and caster sugar in a small pan and heating gently over a medium-low heat until the sugar has dissolved and the berries are in a thick syrup. For the Italian Meringue Buttercream, put the egg whites into the bowl of the stand mixer and add the whisk attachment. Put the sugar and water into a small saucepan with the thermometer and heat until boiling. Just before the temperature reaches 110c, start the mixer going on high to whip the egg whites. Once they have some volume and the sugar syrup is at 110c, remove the pan from the heat and slowly pour the syrup in a stream into the mixer as it whips the eggs. Once all the sugar syrup has been poured in, continue whipping until the egg whites are cool to the touch. This can take around ten minutes. It's essential that they're cool or the buttercream will end up runny. Once the meringue is thick and cool, start adding the butter in in small lumps. It will take a while to add all the butter and the mixture may appear to go runny for a while but it will come back together right at the end when the balance of butter and meringue is right. Finally, turn the mixer down to medium and add the vanilla bean paste, beating for another minute until it's all incorporated. To assemble the cakes, use a small sharp knife to cut a deep cone shape from the centre of the cake (don't eat it, you'll need it shortly). Take care to not cut right through the bottom of the sponge. Add a spoonful of the summer fruit mix then trim the cone of cake to fit as a lid to cover up the fruit. Pipe a swirl of buttercream over the top of the cake to cover up the cut but still show some of the pink sponge around the edges. Decorate with the fresh summer fruit and sprigs of mint. The spare buttercream will keep well in the fridge or freezer. You need to bring it back to room temperature and then whip with the stand mixer for five minutes to return it to its original consistency. You can find out more about my experience with doing that here.